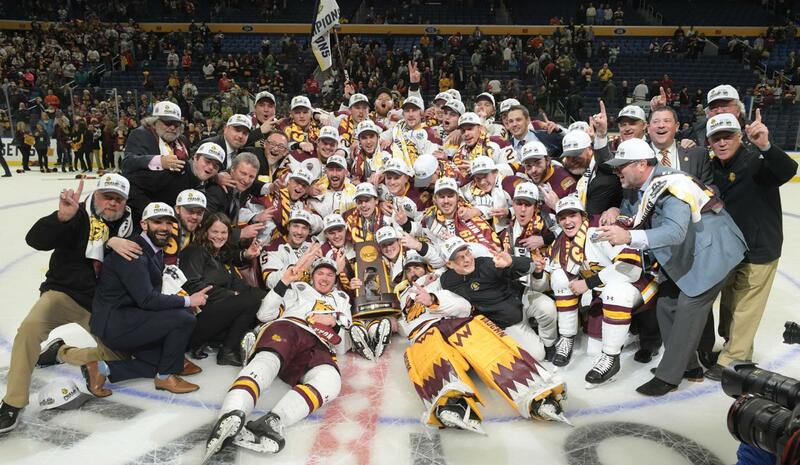 In front of a crowd of 13,624 last Saturday night at KeyBank Center in Buffalo, N.Y., Minnesota Duluth captured its second straight national championship, downing UMass 3-0. The Bulldogs got goals from Parker Mackay, Mikey Anderson (Roseville) and Jackson Cates (Stillwater), and an 18-save effort from 2019 Mike Richter Award finalist Hunter Shepard (Cohasset) to claim the program's third NCAA title in nine years. UMD is the first repeat champion since Denver in 2004-05, after Minnesota also repeated from 2002-03. The Bulldogs finished the season with a 29-11-2 overall record. Mackay struck first for the Bulldogs at 3:51 of the first period on the power play. Using some nice puck movement, Anderson found a streaking Mackay in the slot for the top-shelf backhand goal to beat UMass goaltender Filip Lindberg. Riley Tufte picked up the second assist on the opening lamplighter. UMD controlled play for the majority of the opening period, outshooting the Minutemen 14-5. Minnesota Duluth pushed the lead to 2-0 late in the second period on Anderson's sixth goal of the season. After taking a big hit at the blue line, Anderson flashed into the slot and took a Mackay pass to go high to the glove side to beat Lindberg. The second period saw a few more chances for the Minutemen, but the Bulldogs still won the shots battle 11-7. Minnesota Duluth got the insurance goal at 17:18 of the third period as freshman forward Jackson Cates picked up a loose puck in the left circle and beat Lindberg to the short side. Cole Koepke and Anderson earned assists on Cates' eighth goal of the season. UMD continued its spectacular defensive play in the third period, holding the Minutemen to only six shots and few scoring chances. The Bulldogs wrapped up the game on the power play, not allowing UMass to pull Lindberg for an extra attacker. Minnesota Duluth finished the game with a 31-18 advantage in shots. Mackay was named the NCAA Frozen Four's Most Outstanding Player, notching 1-2--3, including a goal and assist tonight. UMD fowrds Justin Richards and Billy Exell, Anderson and Shepard joined Mackay on the All-Tournament Team, along with defenseman Marc Del Gaizo from UMass. The Bulldogs advanced to the title game with a convincing 4-1 win over Providence in the national semifinals. UMD got goals from Richards (2), Exell and Dylan Samberg, and a 28-save performance from Shepard. 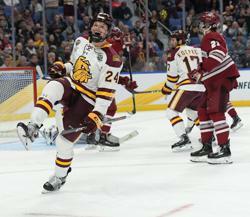 Minnesota Duluth advanced to the Frozen Four with a 2-1 overtime win over Bowling Green and a 3-1 win over Quinnipiac at the NCAA Midwest Regional in Allentown, Pa. 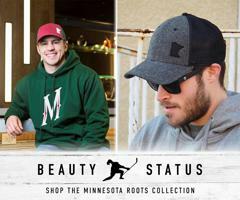 The UMD roster includes 17 Minnesota natives. At least one player from the State of Hockey has now won an NCAA title in 19 of the last 20 years (147 total Minnesotans). A team from Minnesota has now won eight NCAA titles – five for Minnesota (1974, 76, 79, 2002, 2003) and three for UMD (2011, 18, 19). Sandelin’s three national titles are tied for fourth-most by one coach in NCAA history. Only Vic Heyliger (6), Murray Armstrong (5) and Jerry York (5) have more.